Falls Church, Virginia (outside of Washington, D.C.) has the lowest poverty level of any independent city or county in America, as the U.S. Census Bureau found in 2011. But it’s still a surprise that the city got itself a Volvo for a cop car back in the ‘80s. Also, now it could be yours. 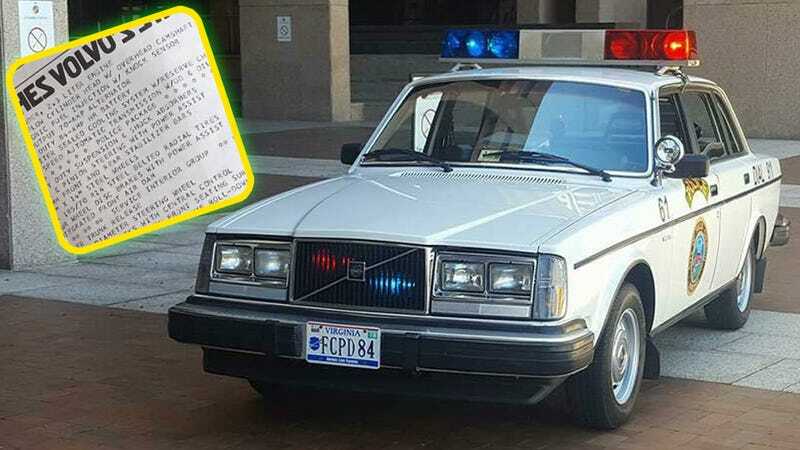 This 1984 Volvo 240 DL sedan came equipped with a police package, something I didn’t realize you could get on a Volvo 240. As the car’s spec sheet lists, the Falls Church police department got heavy duty suspension and shocks, power rack and pinion steering, front and rear sway bars, 14" steel wheels, four-wheel disc brakes, and an integrated front air dam. Nice. The lights, sirens and stickers appear to be aftermarket like on pretty much all cop cars, which is only a slight disappointment. I would have loved some sensible Swedish siren sounds to bleep bloop out of this Volvo. Authentic Falls Church Volvo Police cruiser in 3, not 30 year old condition. Original paint, unrestored, and all equipment is period correct for this agency and functional. This car is fully documented with (but not limited to) window sticker, original sale paperwork, full service history in chronological order, picture documentation of build and verified to be accurate by the same police officers that started their careers in these legendary cars. This car started life in the 2nd order of FCPD police cars, but was used as a “demo unit” by the dealership presumably for Alexandria City PD and maybe some advertising. It was returned to the dealership and sold privately to a Lt General in the US Army, who took it to Florida when he retired and kept it in a dry cool garage for many many years. I built the car and have put 11,000 miles on it in 4 months. This car has taken me places I’d never have expected to go & it has been an amazing ride. You’ll notice a dash plaque from Cleveland, a numbered badge from Police Week in D.C, quite a few awards (they go with the car) that are symbols of unforgettable trips and experiences and I can only hope the next owner will continue the tradition and show the car often. I learned to drive stick in a Volvo 240 and it’s just about the last car I’d pick if I needed to chase down some speedy criminals. But if I wanted to lounge about some quiet suburban streets back in the mid-80s, it’d be hard to find a comfier car to do it in than this sweet Swedish brick.